Messier 109 (M109) is a barred spiral galaxy located in the constellation Ursa Major. The galaxy lies at a distance of 83.5 million light years and has an apparent magnitude of 10.6. 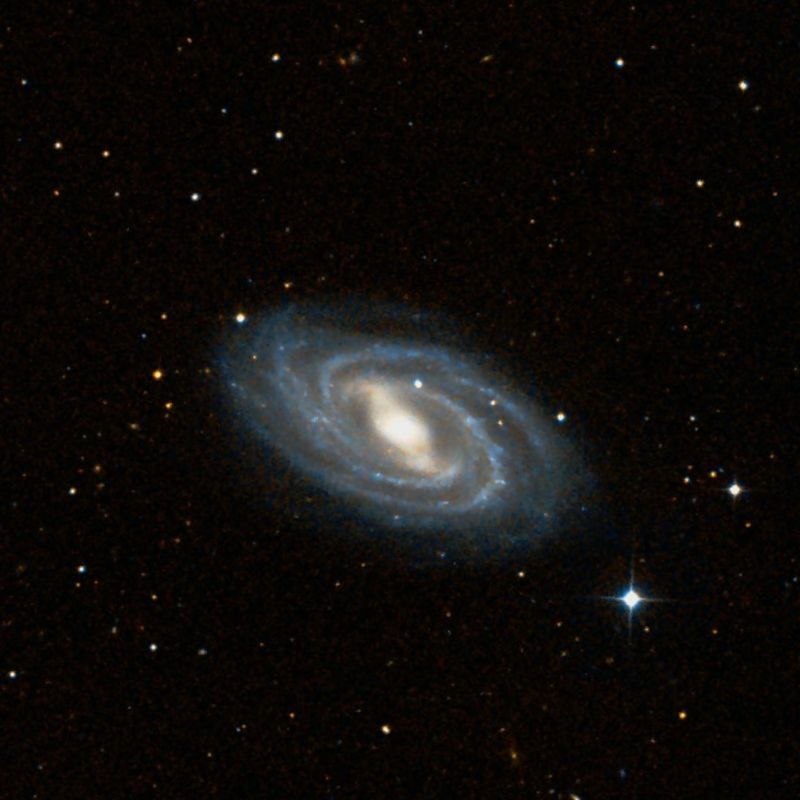 It has the designation NGC 3992 in the New General Catalogue. Messier 109 occupies an area of 7.6 by 4.7 arc minutes of apparent sky, corresponding to a linear diameter of 180,000 light years. The galaxy can be seen in large binoculars in exceptionally good conditions. 4-inch telescopes show a hazy streak of light, while 6-inch instruments reveal the galaxy’s nucleus surrounded by nebulosity. Only the galaxy’s bright central region with the bar can be seen visually. 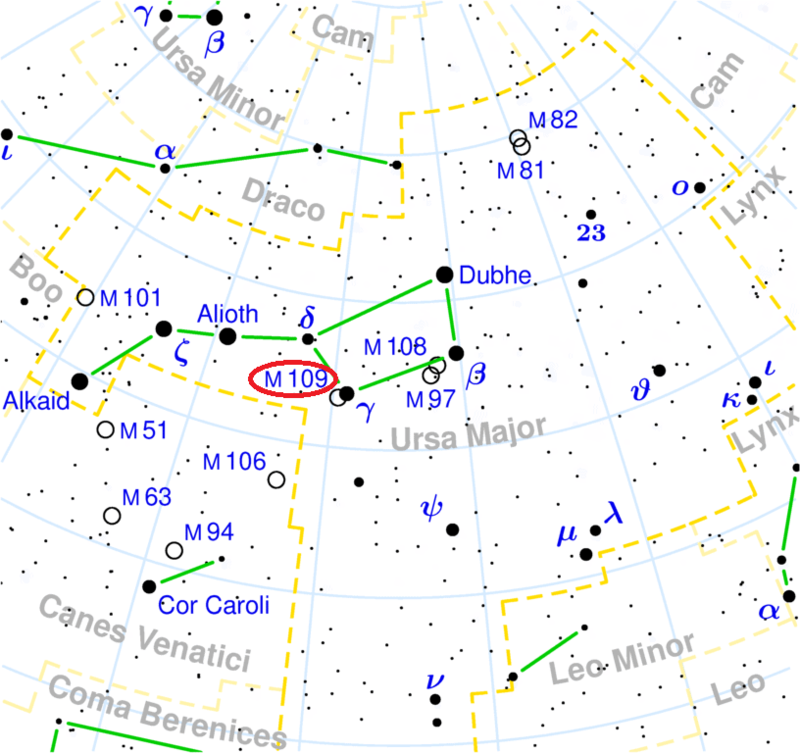 Messier 109 is located only 40 arc minutes southeast of the magnitude 2.44 star Phecda, Gamma Ursae Majoris, the star marking the bowl of the Big Dipper toward the handle. 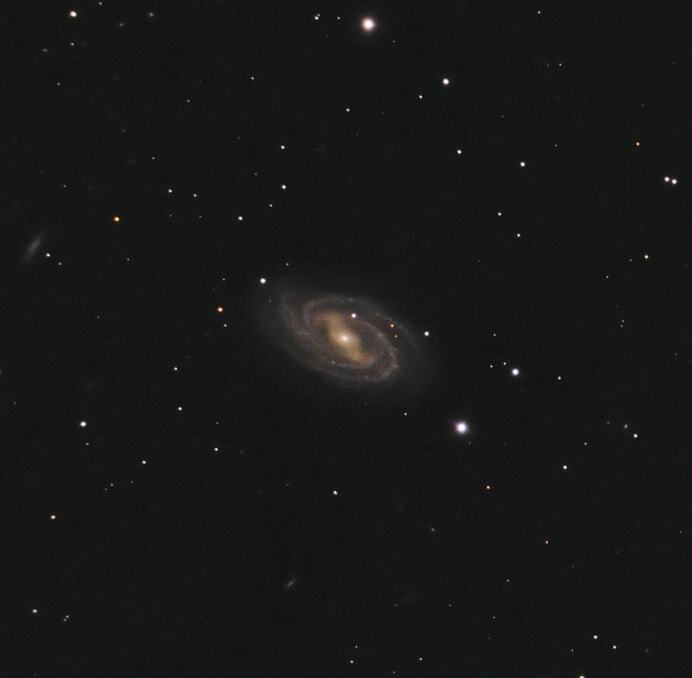 The best time of year to observe M109 is during the spring. Messier 109 contains an estimated 1 trillion stars. It is the brightest member of the M109 Group, a group of 79 galaxies in Ursa Major. It has three known satellite galaxies: UGC 6923, UGC 6940 and UGC 6969. A Type Ia supernova was observed in M109 on March 17, 1956. Designated as SN 1956A, the supernova occurred in the southeast part of the galaxy, peaking at magnitude 12.3. A nebula near Beta in the Great Bear. Mr. Messier mentions, when indicating its position, two others, which I also have discovered and of which one is close to this one [Messier 108], the other is situated close to Gamma in the Great Bear [Messier 109], but I could not yet determine their positions. Although Flammarion found Messier’s notation of the position of the nebula near Gamma Ursae Majoris […] he made no attempt to number it, and because Méchain did not give precise positions, Dr. Hogg omitted identifications of this and the other nebula near Beta Ursae Majoris. From my study of this region, the nebula near Beta is unambiguously NGC 3556, while an examination of the critical limiting magnitude of the catalogue indicates that the one near Gamma must be NGC 3992, a fact confirmed by the position Messier added to his personal copy. Thus, if the objects from M104 to M107 are included, it seems logical to me to number NGC 3556 and NGC 3992 as M108 and M109 respectively, especially as they are mentioned in the original catalogue. However, in October 2006, Henk Bril, a member of the Royal Dutch Association for Meteorology and Astronomy, investigated the maps of Fortin’s atlas of 1795 and discovered that the object seen by Pierre Méchain was not NGC 3992, but NGC 3953, a neighbouring member of the M109 Group. In spite of this, NGC 3992 is still accepted as M109 and now considered one of Messier’s original discoveries. Considerably bright. Bright resolvable [mottled, not resolved] nucleus with very faint extended branches to position angle 30deg north preceding to south following. 7 or 8′ long, 4 or 5′ broad. A beautiful, slightly oval spiral 7′ in length. Bright, almost stellar nucleus; whorls are rather open and show a number of faint condensations; the central portions show signs of Phi-type formation [the bar]. 20 s.n.